Get involved and receive a special edition backcountry poster! 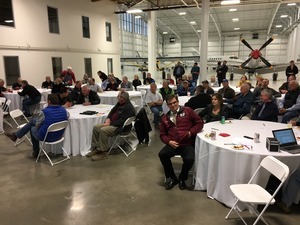 The Idaho Aviation Foundation benefits general aviation in Idaho by supporting initiatives and projects designed to maintain, upgrade and develop airstrips, improve access, and promote safety at backcountry and recreational airports. Although IAF projects and grants primarily benefit general aviation users, many non-aviation outdoor enthusiasts also reap benefits from these efforts. Aviation Association. Congratulations to Bob Patrick of Idaho, who won the system donated by Jackson Jet Center in Boise. Bob flies a Cessna 180 and a Waco biplane—he will have fun deciding what to do with the Stratus ESG 1090ES system. The raffle project raised another $7,240 which will help offset startup costs this year. The lodge project has been 6 years and a million dollars in the making...we thought you might enjoy a time lapse view of the exterior being built. 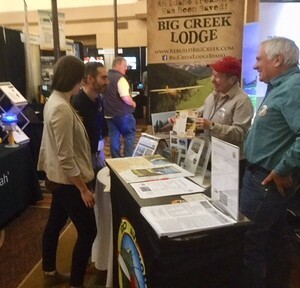 IAF has been out and about promoting the anticipated opening of Big Creek Lodge at various events. We (IAF) co-exhibited with the IAA at the Montana Aviation Conference March 2-3 in Missoula this weekend. Last weekend, the NW Aviation Conference in Puyallup, WA had a great turnout with over 10,000 attendees. We will not be doing “Breakfast at Big Creek” on the lawn in 2018...we are keeping our focus to complete the lodge so you can enjoy it later in the summer. However, you are welcome to come by and see the progress - we may not have workers there every day but suffice to say we are working the schedule with determination. Please join us in congratulating Mike and Theresa Giery of Emmett, Idaho—they are the lodge Caretakers for 2018 and you will love them! It was extremely hard to select THE couple from 21 who applied from around the country (and even around the world). Theresa will be the head cook and interestingly enough is the granddaughter of Dewey Moore who lived on Big Creek for 30 years. Mike is an all around handyman and is also an EMT, serving as Deputy Chief for the Emmett City Fire Dept. We anticipate fully opening Aug 1 but they will be up there part time in June and July helping to finalize things and set up the kitchen. They can’t wait to meet you and to ensure you have a wonderful experience at Big Creek Lodge! We anticipate opening on or before August 1, and are planning for a Grand Opening Party, to be announced later. You will be able to make lodging reservations starting in April when we launch our new website. Stay tuned for more information on those details! Pricing will be announced later—the 4 lodge rooms and 2 duplex cabin rooms will be priced per person and will include lodging, 3 meals, use of mountain bikes, access to trailheads, other activities, and taxes. The yurt will also be available on a per person basis, but is designed as a more independent experience, so meals, showers and other services will be extra to the per person rate. Stay tuned for all those details, and be watching when we unveil a new logo that better conveys the Big Creek Lodge aura with a more rugged look and is more adaptable for multiple purposes (website, stationery, embroidery, etc). As announced earlier, The lodge and some outbuilding repairs are fully funded! We continue to raise money to build a “startup” and ongoing operations fund. We need to purchase some tools, inventory (grocery items, staples, etc) and pay Caretakers before positive cash flow has been established, and we wish to raise $50,000 for that purpose. It is not too late to become a Log Lifter for $1,000 and get your name on an antique saw to be displayed in the Lodge. Visit our donation page for other ideas about donating. Another easy way to donate is via Amazon’s Smile program for non profits. Go to smile.amazon.com/ch/82-0507368 and Amazon donates to Idaho Aviation Foundation. Thanks for your continued interest in this amazing non profit effort - built for and by the public! As work continues in the very small construction time window at the lodge site, we will once again welcome the public to enjoy 'breakfast on the lawn' and tour the site and structures you have helped rebuild and restore! Breakfasts are $10/plate and include delicious pancakes, ham, eggs, coffee and juice. The events are early morning (8-10 am) to maximize the safety of flying guests arriving and departing in mountain conditions with potential wind. Profile Pass will likely not be navigable by car in late June; and we hope to add a date later in the season for the driving public! We made significant progress at the lodge site in 2016, and continue to close in on completion. 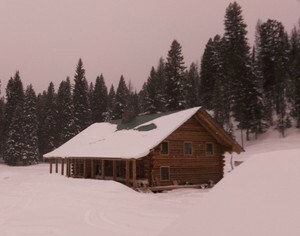 Take a look back at 2016 on our site specific to the Rebuild Big Creek Lodge project: http://www.rebuildbigcreek.com/index.php/news/77-big-creek-lodge-update. We did it! 1171 license plates were sold by December 31, 2017. This means that the program will continue for at least two more years. In order to continue to keep the plates in circulation there must be at least 1000 plates sold annually; if we drop below that limit for 2 years in a row we will lose the program. See more on our Projects page. Every June for over a decade, IAF helps individuals with disabilities to enjoy a few days relishing a wilderness experience, using the assistance of back country aircraft to get them to and from a beautiful destination. 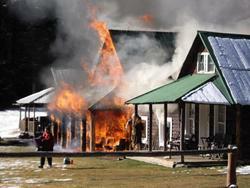 In recent years, we have flown participants to Sulphur Creek Ranch. The participants enjoy fantastic food and accommodations supplied by Kieri, Valdean, and their staff. Horseback riding and fishing are much enjoyed as well as the camaraderie of a group together in the wilderness. The IAF Wilderness Within Reach Program is a joint venture with the Boise City Parks and Recreation department AdVenture program, which provides year round activities for adults and youth with disabilities. 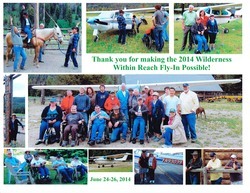 Over the past twenty-five years Wilderness Within Reach has helped over 415 individuals with disabilities, who may never have been able to do so on their own, experience and appreciate the Idaho wilderness. For more information about Wilderness Within Reach contact Joe Corlett at 208-890-1819 or jcorlett@appraiseidaho.com. 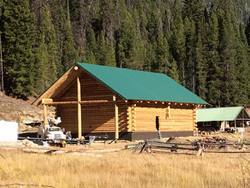 For more information on Sulphur Creek Ranch in the mountains of Idaho contact Kieri at 1-254-378-7473. What an accomplishment! In October 2015 the building shell was completed. Thanks to our many donors and volunteers for making it happen! We need about $250,00 to complete the interior. If fund-raising continues successfully we plan to accomplish this by Fall of 2016. For more pictures and information on how to help us get it completed in 2016 go to the Rebuild Big Creek Website. 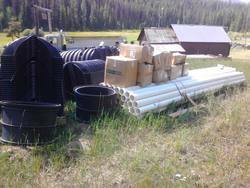 Work has already begun at the site with the installation of the septic system! The Ground Breaking Ceremony will be Saturday, July 18th at 8:30 a.m.; coffee and donuts will be available. Check our web cam for construction activity. 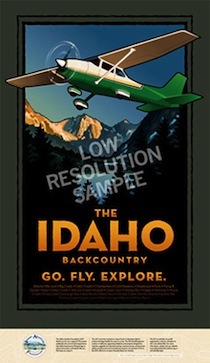 The Idaho Aviation Foundation cannot emphasize enough how supportive the USFS has been of the Lodge project. In fact, they have awarded the IAF a THIRTY YEAR Special Use Permit for ongoing operations at Big Creek. This is HUGE! We previously announced a 20 year permit—but they went to bat internally for this project and added another 10 years to the permit. 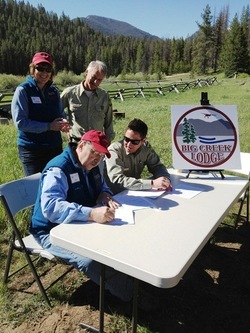 At the Big Creek Breakfast event on the 15th, a ceremonial signing of the Special Use Permit by the Forest Service (Anthony Botello (seated) and Clem Pope from the Payette National Forest/Krassel District) and Idaho Aviation Foundation representatives (President Jim Davies (seated) and Vice President Colleen Back). After the signing, the US Flag was raised on the Lodge Site for the first time since 2008. See more about the project on our Current Projects Page.